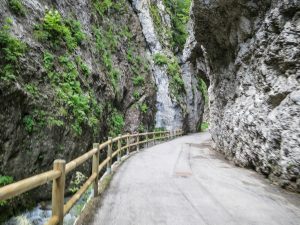 A long time ago, in the local province road planning offices there was a road engineer that needed to resolve a tough problem: to design a road that connected Canazei in the Fassa Valley to Caprile on the other side, with a climb in the middle located at the feet of the Marmolada glacier. He had to avoid dangerous situations as much as he could – the mountain ridges on both sides are exposed, causing avalanches in winter. And, in order to keep the road open during winter as much as possible, he had to apply his best designing skills and experience. Once the climb from Canazei towards Fedaia was on paper it was time to draw the descent towards Caprile. He did a good job drawing all those hairpins that from above look like a roller coaster. Then, it must have been late at night and, after so many calculations and several drafts, he probably started to get tired. His eyes blinked slower and slower, until his upper eyelids made a ‘touchdown’. His heavy head rested gently on his left hand and the pencil in his right hand glided south, drawing a straight 2.7 km line on the blueprint. The next morning when he woke up he just continued to draw from where he had left off and…lo and behold!…. he decided to add a few more hairpins! Fedaia is tough! Really tough! 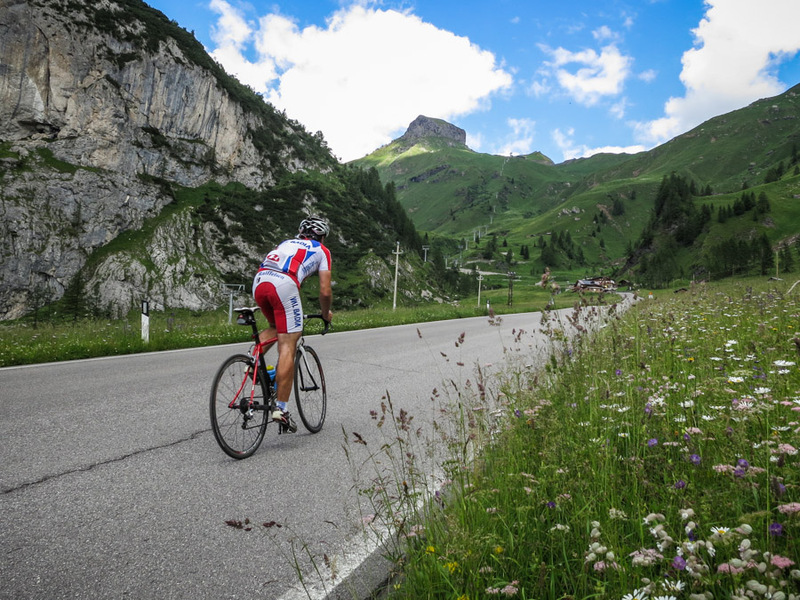 It is definitely among the hardest climbs you can ride in the Dolomites and it also has some interesting characteristics that you should not miss. 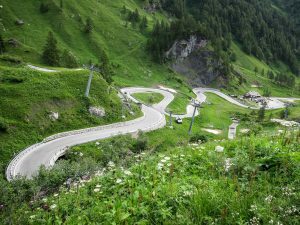 The climb starts in the town of Caprile where you can also find the junction to climb the Passo Falzarego or – just 500 meters away – you can start the long climb to the Passo Giau if you decide to ride up the Val Fiorentina first. From Caprile it takes just a few km to reach the town of Saviner di Laste, where the Fedaia welcomes you with a 10% gradient. It’s not far, but your legs may already feel hard if you get to the start with cold legs after a long descent from the Falzarego or Digonera. 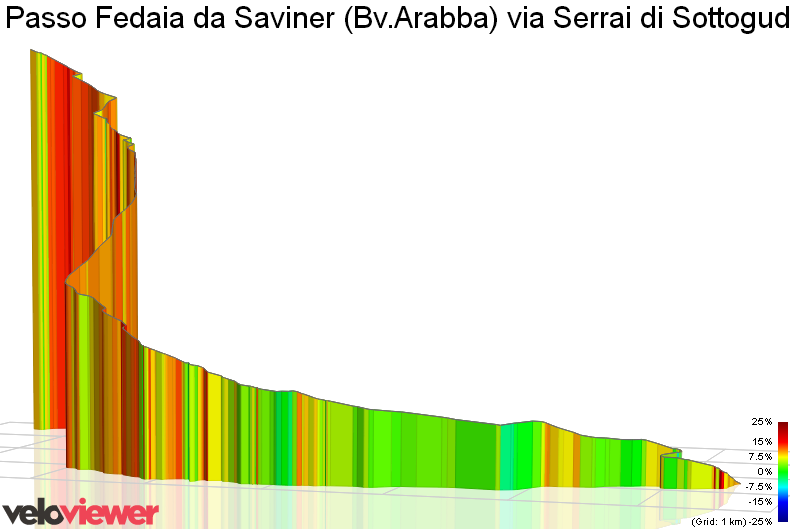 The climbing gradient of the Serrai di Sottoguda is between 9% and 11% but you won’t feel it. There is so much to see in this magical place that time flies and you suddenly find yourslef out of this 2 km long canyon. Once you are on the main road again, the most painful part begins. It’s a 2.7 km long stretch from Malga Ciapela to the hut known as Capanna Bill. As soon you are out of the Serrai di Sottoguda, the GPS device will switch continuously between 10-11% … then 11-12% …. and 12-13% until it reaches 15% shortly before the hut. You can see the hut 1 km away before you reach it and, above it, the only hairpins of the Fedaia that you dream of reaching as soon as possible in order to relieve the pain (forget it!). This is the name of the beautiful gorge that stretches for about 2 km from the town of Sottoguda to Malga Ciapela. The route is lined with sheer cliff walls more than one hundred meters high. Along the way the path narrows in places to where the walls are nearly touching each other. Depending on the winter snowfalls, the Serrai opens around beginning-mid May. Starting mid-June until mid- September, cyclists that ride through the Serrai have to pay a toll of 2.00 Euro (worth every cent). The beauty of the place attracts countless visitors – meaning, there are some periods when it’s better to avoid the Serrai…like in August, when there are plenty of tourists on holiday…unless you get up the Serrai before 9:30 AM (at the latest!). Any later, and it’s possible you may have to walk up the whole road. Back to Capanna Bill, at the end of the straight stretch. If you’re expecting to hear a different ‘tune’ at the start of the hairpins, you’ll be dissapointed because that’s not going to happen. Yes, there is a little relief as the hairpins allow you to breathe …. BUT …. 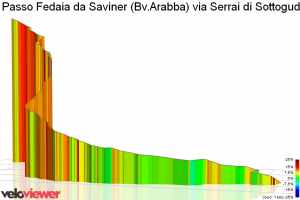 now the steepest gradient reaches 15% and 16%. This continues for the last 2.5 km to the top. Once you get there, the road suddenly flattens and you’ll feel as if you’d taken the last step on a steep staircase. I suggest not stopping there but to continue until you reach the artificial lake (just a few hundred meters away). The top of Passo Fedaia is a 2.5 km flat plateau where you can also take a few loops around the artificial lake. It’s not unusual to see pro teams like Cannondale or BMC with their pro-riders doing altitude training and spinning around the lake doing sprints. 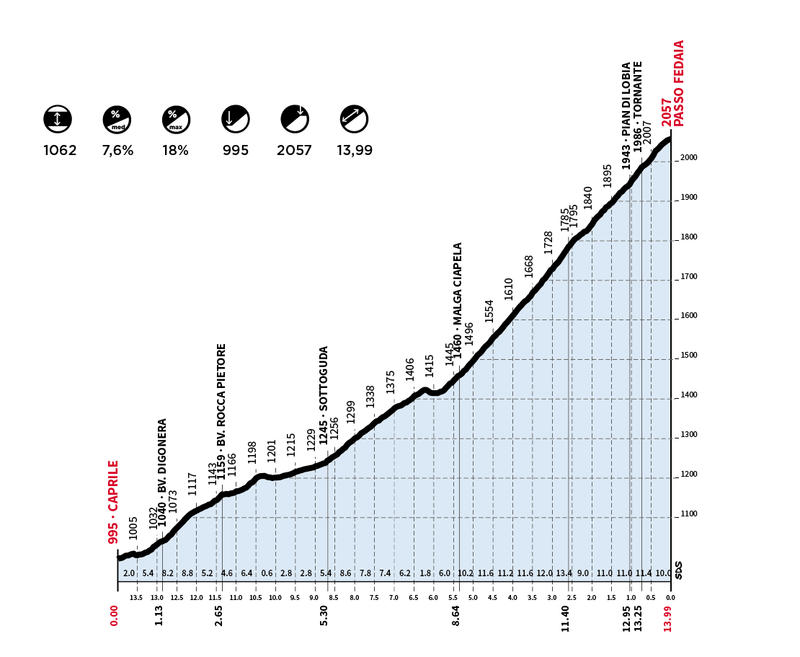 The Maratona dles Dolomites climbed Passo Fedaia on this side in the editions from 1990 to 1992. Hi, Well, the other local names (rather than the Val Badia/Gadertal name) are Jouf de Fedaa (east) & Pas de Fedaa (west) (for what I know). Heights according to the local technical maps are 2054m (road height 2059m). Hi Igor. So cool an informative page you have here. Have been reading everything as I plan going for 4 intense days in the dolomites mid septemper. Hope weather is good. As i see it unless you are in a really good condition/form (which i’m not) the i might need to drive by car or go up Fedaia and then straight back and the same for Giau if living in Badia? I would like to manage them all in these 4 days but i simply don’t think i can go more than around 100km pr day as max. 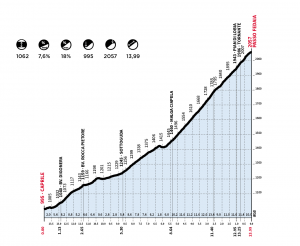 But would it be a mistake to miss the San Pellegrino Pass? I saw Nibali and Bahrain teammates using that too for prep for Tour de France..